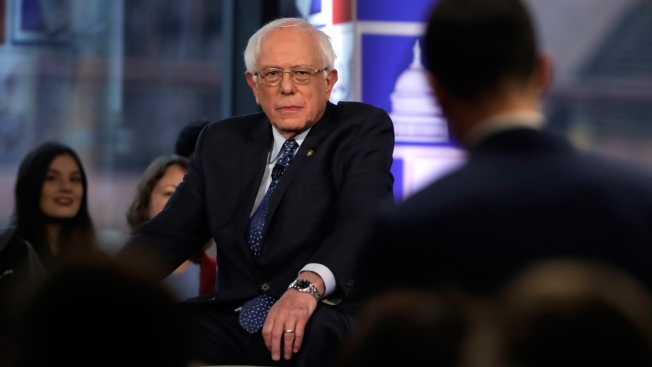 Sen. Bernie Sanders listens to a question from an audience member during a Fox News town-hall style event Monday April 15, 2019 in Bethlehem, Pa.
Sen. Bernie Sanders spent much of a Fox News town hall Monday discussing his signature “Medicare for All” proposal, which has energized liberals and fueled conservative backlash. The Vermont independent should be encouraged by the Bethlehem, Pa. crowd’s reaction to his plan. At one point in the event, Fox’s Bret Baier asked attendees if they get private health insurance from work. A majority of audience members raised their hands. Baier then asked whether people would be willing to transition to a government-run health system as described by Sanders. Roughly the same number of attendees raised their hands. Some audience members cheered. Baier noted during the town hall that the crowd included Democrats, Republicans and independents. Trump, a frequent Fox viewer who often shares supportive talking points from the network’s conservative hosts, tweeted Tuesday that it was “so weird to watch Crazy Bernie” on Fox News. Sanders is a self-described democratic socialist and a frequent target of the network. “Not surprisingly, @BretBaier and the ‘audience’ was so smiley and nice. Very strange, and now we have @donnabrazile?” Trump added, referencing the former interim Democratic National Committee chair who recently joined Fox as a contributor. Sanders vaulted to national prominence in the 2016 presidential election in part by arguing for insuring all Americans through a single-payer system. Now, Medicare for All has gained traction among Democrats in both the House and Senate, as well as among Sanders’ rivals for the 2020 Democratic presidential nomination. As Democrats try to thwart President Donald Trump’s re-election bid in part by criticizing his efforts to repeal the Affordable Care Act, the president and congressional Republicans have cast Sanders’ proposal as a radical, expensive plan that would dismantle the private insurance market. During the town hall Monday, Baier pressed Sanders about the prospect of his proposal forcing people off the private insurance plans they currently have. It should not come as a surprise that Sanders’ plan fared well in presidential swing state Pennsylvania. In March, 56 percent of people surveyed by the Kaiser Family Foundation said they support a “national health plan in which all Americans would get their insurance from a single government plan,” while 39 percent said they oppose such a proposal. Support for a single-payer system climbed from 50 percent in a Feb. 2016 Kaiser poll. However, support for Medicare for All drops significantly if poll respondents are told it could require most Americans to pay more in taxes or eliminate private health insurance companies, according to separate Kaiser polling. Last week, Sanders introduced a new version of his Medicare for All legislation. It would cover a wide range of health services and let Americans see any doctor with no deductibles or copays. Four other senators running for president — Cory Booker of New Jersey, Kamala Harris of California, Kirsten Gillibrand of New York and Elizabeth Warren of Massachusetts — co-sponsored the bill. Among contenders in the Senate, only Sen. Amy Klobuchar, D-Minn., did not back the plan. She supports an optional government health care buy-in.